We are located at 620 Scottsdale Drive (at the corner of Scottsdale Drive and Stone Road – across from the Stone Road Mall). Plenty of free parking is available at our facility! South City’s beautiful newly renovated 4,600 square-foot air conditioned clinic has fifteen beds – ten private treatment rooms, three cubicles, and two dedicated massage therapy rooms. 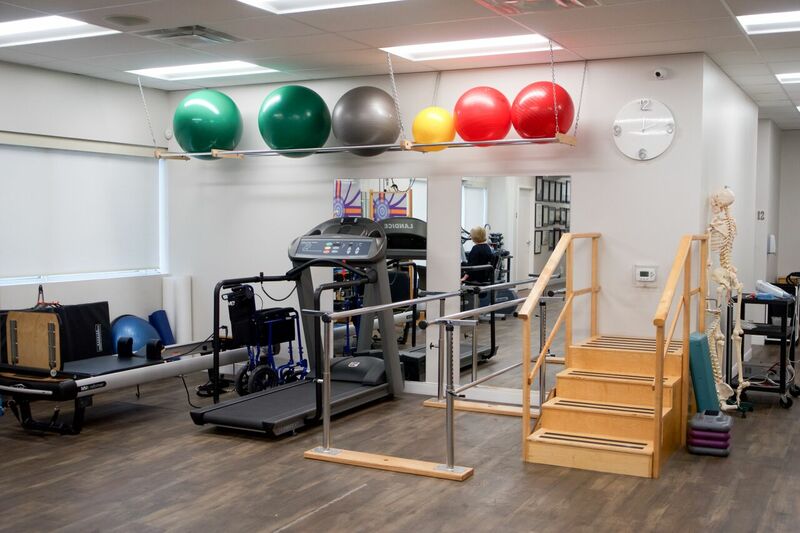 Our fully equipped rehab gymnasium is equipped with weight stacks, free weights, pulley systems, a bi-directional rehab treadmill, stationary bicycles, a reformer, gym balls and more! In addition to hands on treatment by our highly qualified therapists, South City employs the most recent and effective therapeutic treatments and modalities: ultrasound, laser, electrotherapy, electro-acupuncture, micro-current, hot and cold therapies, muscle stimulation, and EMG biofeedback.